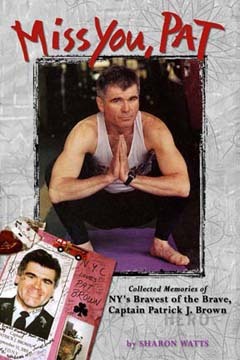 Many of his fellow yoga practitioners had no idea that Pat was a legend in the FDNY, with a sixth sense that enabled him to quickly find helpless victims in utter chaos and dense smoke. Likewise, his brother firefighters had no idea that “Paddy” was a Black Belt in karate who taught self-defense to the blind. Or that he was a decorated USMC Vietnam War veteran. Or an accomplished boxer and former Golden Gloves contender. Or a Broadway musical theatre buff. Pat didn’t talk about what he did; he just went out and did it. Captain Patrick J. Brown had an uncanny ability to be exactly where he was needed at exactly the right time. He died on September 11, 2001, surrounded by scores of burn victims he was trying to evacuate from the WTC’s North Tower. Outside the FDNY, the many people whose lives he touched insist that he was inspired when it came to knowing their hurt, and how to heal it. To deal with her loss, his close friend and former fiancée, Sharon Watts, began collecting stories about Pat, carefully stitching them together with her own personal narrative. The result is an intimate and moving literary experience, as well as a riveting introduction to a highly complex man whose legacy— encapsulated in MISS YOU, PAT— is destined to live on. I loved reading about this amazing man. Joan~ your purchase and read of the book was so appreciated!